Micro-motion systems are advancing the performance and availability of optical systems used in applications, including facial recognition, iris scanning, DNA testing, and advanced medical diagnostics. Auto focus, used in biometric iris scanning, provides an increased field of focus for rapid capture at variable distances, and enables faster, less obtrusive detection systems with very high accuracy. Along with advancements in microfluidics-based technology for DNA analysis, flow cytometry, and other advanced medical diagnostics, motion systems are responding to the need for precise alignment of optical systems with an ability to focus light onto detectors or image sensors for analysis. 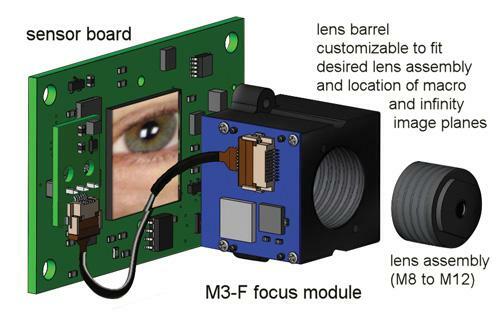 Custom M3-F focus modules can meet specific OEM requirements for sensors, lenses, and mechanical and electrical integration. Viggiano says to achieve that level of focus, systems need to resolve the image within a much finer depth of focus than what was needed in the past to meet the needs of more versatile and robust applications. There is a need to design an optical system, not only with an ability to resolve the image at a much narrower depth of focus, but also to adjust the lens system to create a solution to meet those requirements for high-resolution positioning and high-resolution image quality. New Scale Technologies provides a best-in-class solution for these applications, including not only the high-resolution positioning required, but also precise motion (low tip and tilt) at the lens, and excellent repeatability. Their technology enables rapid focusing of the optical system, and therefore, a faster resolution of the iris and identification of the subject. In addition to high precision and resolution, maximizing the range of travel in such a small package is enabling the advancement of this technology in handheld portable devices, point of service areas, and applications where the location of the subject is not as tightly controlled. New Scale’s production-ready, micro-motion modules are based on their patented piezoelectric motors and related micro-motion technology. By partnering with leading sensor and lens providers, they are able to deliver complete solutions from product development through high-volume production.